Coincidentally or not, there’s been a noticeable increase in media attention to the tunnels in Gaza, many of which lead to Israel and are (allegedly) used by Hamas militants for attacks. The Israeli government has said that destroying the tunnels is one of the rationales for the war. That is revealing, since the only thing missing from these nightmarish scenarios of terrorists emerging from the ground to kill innocents is any evidence that anything like this has ever happened. The Times story quotes Israeli Prime Minister Benjamin Netanyahu saying the “sole purpose” of the tunnels “is the destruction of our civilians and the killing of our children.” But have there been any such attacks? Journalist and media critic Greg Mitchell has posed this question on his blog (Pressing Issues, 7/29/14), where he reports that CNN‘s Jake Tapper responded to his queries on Twitter by noting that all of the the tunnel deaths he was aware of have been Israeli military. Glenn Greenwald (Intercept,7/29/14) notes that the Israel–often credited in US media with taking great care to avoid civilian casualties–has actually killed three noncombatant for every “militant.” Meanwhile, only 5 percent of the much smaller number of deaths caused by Palestinian fighters have been civilians, even though Hamas’s disregard for innocent life is taken for granted by US journalists. 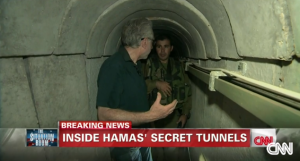 If outlets like CNN and the Times are going to give so much attention to these Hamas-built tunnels, shouldn’t they add this context to their reporting? Or is the “propaganda push” just more effective when these inconvenient facts aren’t mentioned?